First Nations of the very early days had several names for this stream. Michael Byrne of the Western Union Telegraph Company, although he did not see the river, was told that it was the “Hootalinkwa” or “Hootaliqua”. The first miners to prospect up the river from the Yukon in 1881 called it the “Iyon” after the tribal name of the natives living at its mouth. The USC&GS map of 1884 used this name. Lt. Frederick Schwatka, US Army, while on his 1883 excursion named it the “Newberry River” after Professor Newberry of New York. This name was never accepted or used. The Tagish called it “Nas-A-Thane” meaning “No Salmon”, although there are many in the river and lake. Some early maps mistakenly named it the “Tahko River”. 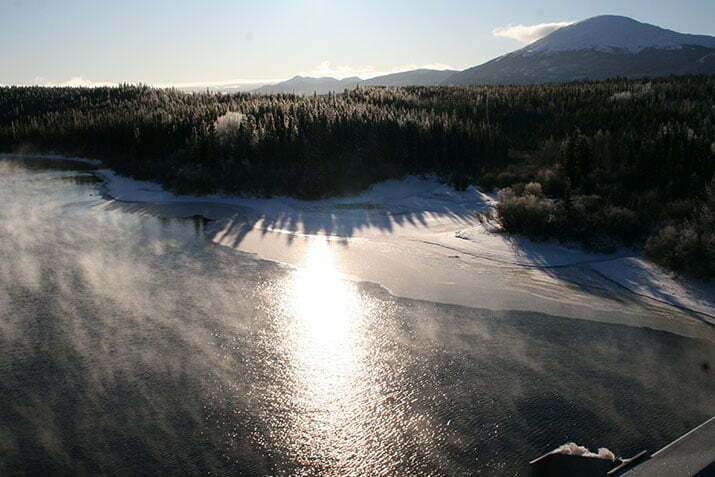 This was the first major tributary to the Yukon River to be prospected. Fine gold was found in many of the gravel bars along it, but no coarse gold was ever located. It was one of the major routes to the Klondike goldfields in 1897-98. After prospectors reached Teslin Lake, the river was clear sailing down to Dawson and all major obstacles were bypassed.